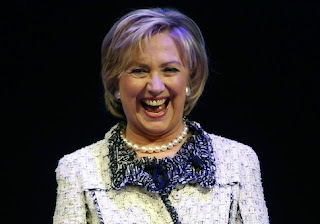 In the latest chapter in Maureen Dowd's never-ending story of the Clintons, "When Hillary Clinton Killed Feminism", the long-time New York Times columnist builds her case in the only way Maureen seems to know how: by putting thoughts into Hillary's head and words into Hillary's mouth.. Even after all these years, Maureen is still trying to invent Hillary the Terrible, Hillary the Prevaricator, Hillary the Shallow. And every time she's sure she's got it, every time Dowd writes the perfect scenario, in which her character lives up to her previous, masterful buildup, Hillary the Unpredictable takes off in another direction. And Dowd fumes! Even on the printed page you can see Dowd fuming. Hillary is HER invention! HER antagonist! Who the hell does she think she is? "The Clintons seemed to have. . ."
"It turned out that female voters seem to be looking at. . ."
"Hillary started from a place of entitlement. . ."
"Hillary’s coronation was predicated on. . ."
"The Clintons assumed. . ."
"And now she's even angrier. . ."
"Hillary has an 'I' message: I have been abused and misunderstood and it’s my turn." "It’s a victim mind-set that is exhausting. . ."
"Hillary knew that she could count on the complicity of feminist leaders. . ."
"And that’s always the ugly Faustian bargain with the Clintons. . ."
What a story! The stuff of great fiction, and Maureen Dowd is without a doubt a great story-teller. But if there was a part in there about Hillary killing feminism--as the title suggests--I must have missed it. But let's say it's in there and I did miss it: Hillary Clinton has been accused of a lot of things, but killing feminism is a new one. The last I looked, feminism is alive and well and doing just fine. The plot twist comes when Dowd tries to portray Hillary as a perennial victim, only to give her the power to kill an entire movement. It stretches credulity, even for fiction. At risk of seeming presumptuous, let me just say, writer to writer, woman to woman: Maureen, honey, it's time. It's time to let it go, to move on to something new. You've done all you can with this one, and it's just not working. Now you're repeating yourself. Even in fiction, the same old story is still the same old story.